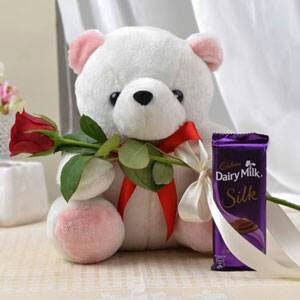 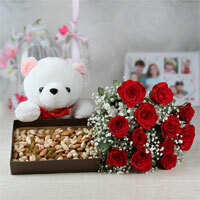 180 gms Vochelle almonds chocolate box, 2 perk of 15 gms each, 26 gms 5star and 6 inch long teddy bear. 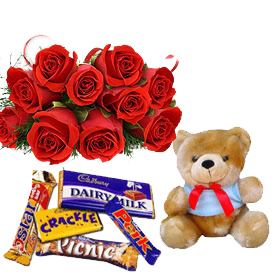 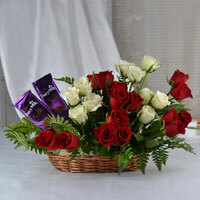 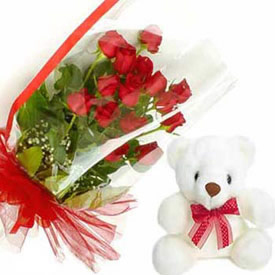 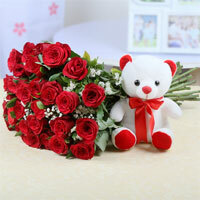 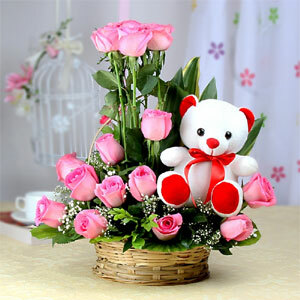 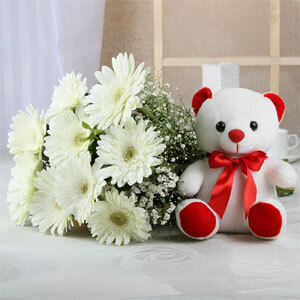 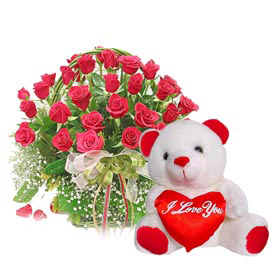 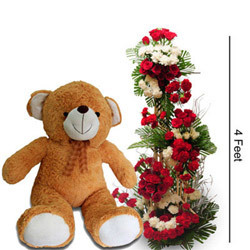 Hamper Contains : 25 Red Roses round shape basket and small cute Teddy Bear. 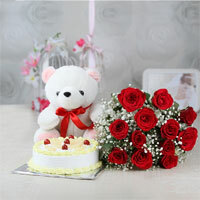 Hamper Contains : 12 Red Roses Bunch, 1/2kg Normal Chocolate Cake and Small n Cute Teddy Bear. 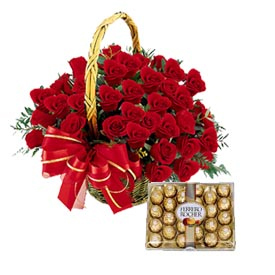 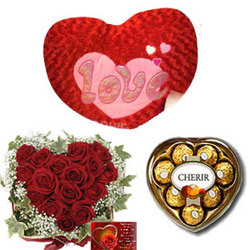 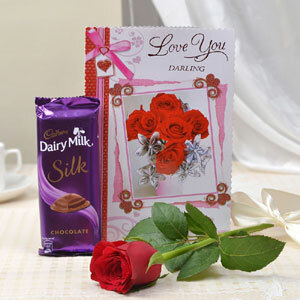 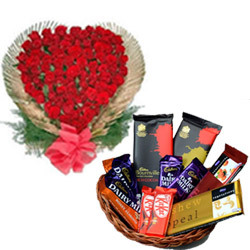 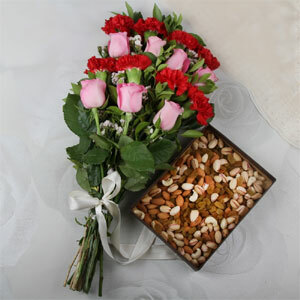 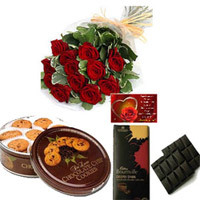 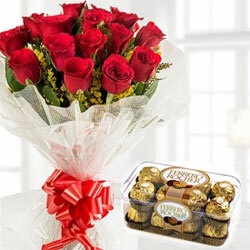 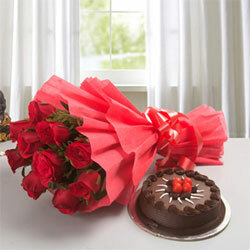 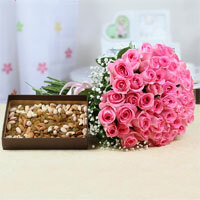 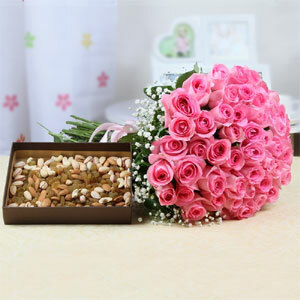 Bunch of 15 Red Roses in paper packing with 16 ferrero rocher box is a perfect valentine gift for your valentine. 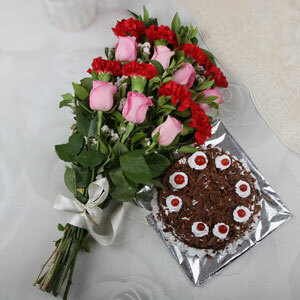 15 Mix Flowers with Matching Ribbon Bow Tied, 1 Kg Black Forest Cake. 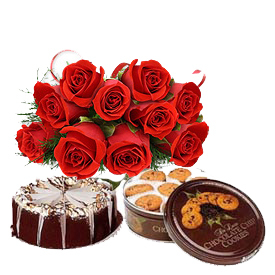 Hamper Contains : 12 red rose bunch, 500 gms Danish Butter Cookies Gift Box and 1/2kg Normal Chocolate cake. 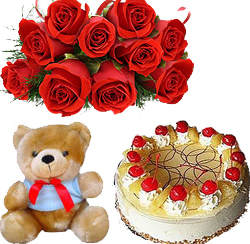 Surprise that someone special... Express your love with a special way..and let them think...you are just as sweet as can be. 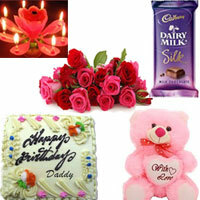 Bunch of 6 purple/blue orchids alongwith 1/2 kg blackforest cake and a 6" height cute teddy bear. 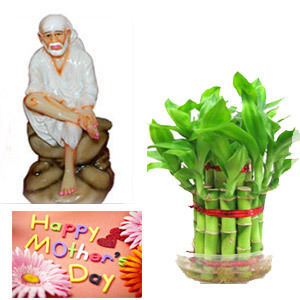 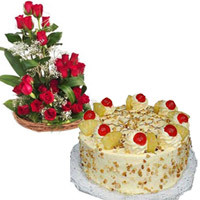 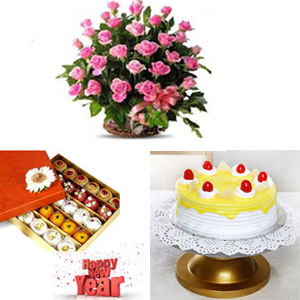 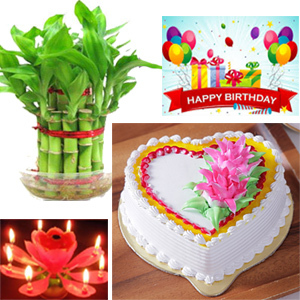 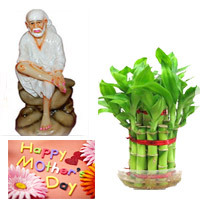 1kg Heart shape butter scotch Cake + Birthday Greeting card Birthday candle +Happiness is a gift that we are offering you and your dear ones through this Good Luck Bamboo plant. 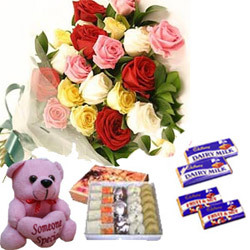 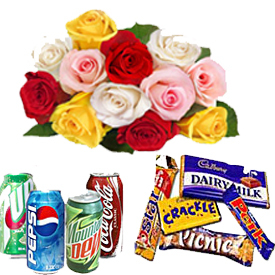 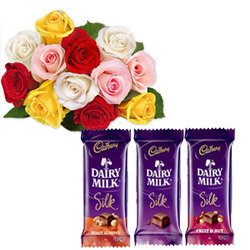 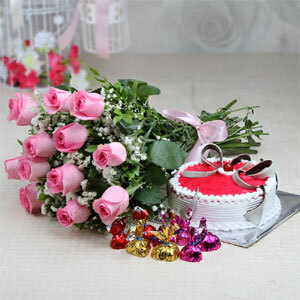 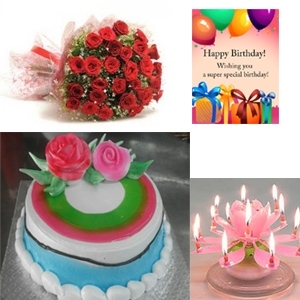 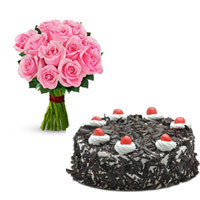 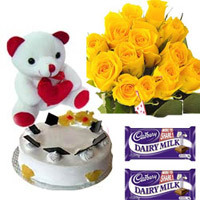 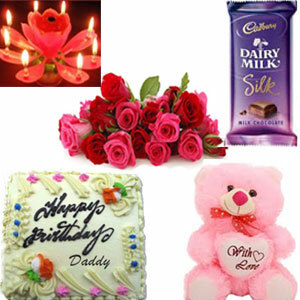 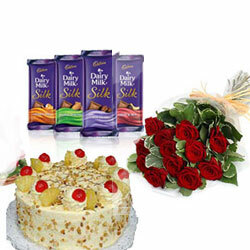 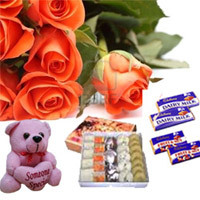 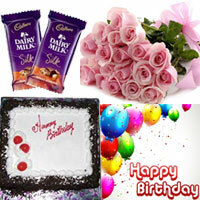 This gift combo is comprises of one white teddy bear, one kg chocolate cake and a bunch of six pink roses. 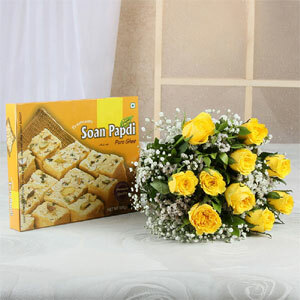 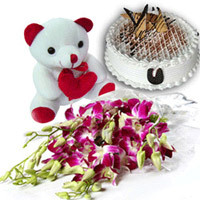 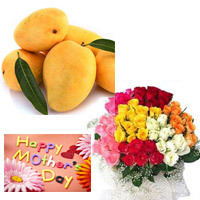 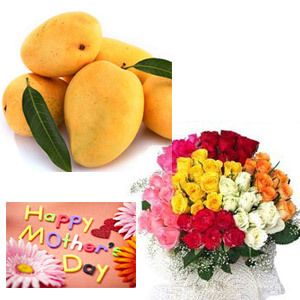 Have a look at this very special gift combo white teddy bear, 1kg pineapple round shaped cake and a bunch of 15 pink roses. 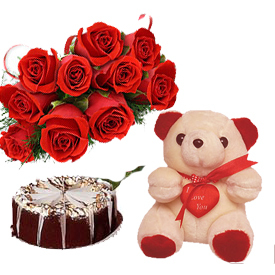 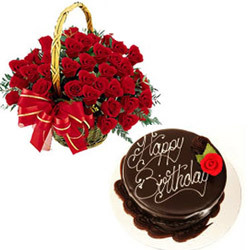 Arrangement of 20 Red Roses & 1 Kg Heart Shape Chocolate Cake Teddy bear 6 inches. 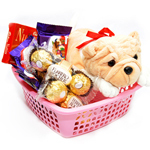 Basket of Imported Chocolates: Ferrero Rocher 16pc 1 Nos, Nutties Small Box, Cadbury Fruit Nut 2 Nos, Small Cara-milk toffees with a Soft toy. 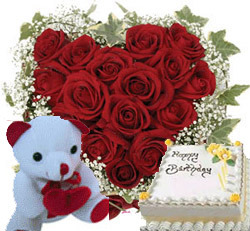 Arrangement of 30 Red Roses in heart shape & 1 Kg Heart Shape Chocolate Cake Teddy bear 6 inches.